Once again, it was Raquel Rodriguez to the rescue for Sky Blue FC at home. 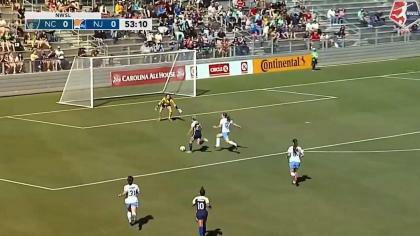 Three weeks after she won the game in the 83rd minute, she was back at it again, scoring the game-winner in the 85th minute as Sky Blue topped the Houston Dash 2-1 in front of 2,476 fans at Yurcak Field in Piscataway, N.J.
Rodriguez’s goal came off a free kick from midfielder Daphne Corboz. With the scored tie 1-1 in the 84th minute, Houston defender Cami Privett was issued a yellow card for a foul on forward Leah Galton about 30 yards from goal. 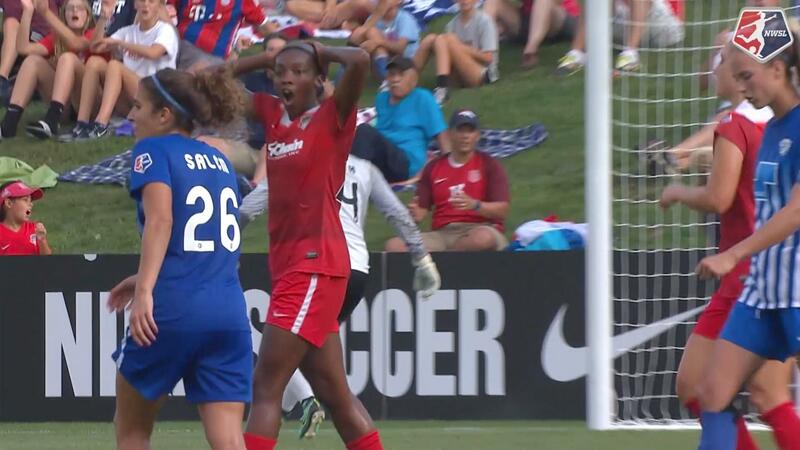 Corboz sent the ensuing free kick into the box where Rodriguez toe-poked it past Dash goalkeeper Lydia Williams after a missed clearance by the Houston defense. Sky Blue FC got on the board first in the 20th minute after another penalty kick scored by Sarah Killion, her fourth of the season and eighth of her NWSL career. She know leads the league with five goals. Killion’s PK came after forward Sam Kerr earned a foul in the box. Houston came back though and Andressa scored in the 40th minute to make it 1-1 before halftime. Match ends, Sky Blue 2, Houston Dash 1. Second Half ends, Sky Blue 2, Houston Dash 1. Attempt missed. Amber Brooks (Houston Dash) right footed shot from outside the box is too high. Attempt saved. Denise O'Sullivan (Houston Dash) right footed shot from the centre of the box is saved in the bottom right corner. Attempt blocked. Melissa Henderson (Houston Dash) right footed shot from the right side of the box is blocked. Assisted by Caity Heap. Substitution, Sky Blue. Madison Tiernan replaces Samantha Kerr. Delay in match Janine Beckie (Houston Dash) because of an injury. Goal! Sky Blue 2, Houston Dash 1. Raquel Rodríguez (Sky Blue) right footed shot from the centre of the box to the bottom right corner following a set piece situation. Cambria Privett (Houston Dash) is shown the yellow card for a bad foul. Attempt missed. Raquel Rodríguez (Sky Blue) header from the centre of the box is high and wide to the right. Assisted by Daphne Corboz with a cross following a corner. Corner, Sky Blue. Conceded by Morgan Brian. Attempt saved. Rachel Daly (Houston Dash) right footed shot from long range on the right is saved in the top centre of the goal. Assisted by Caity Heap. Substitution, Houston Dash. Caity Heap replaces Andressa. Attempt saved. Samantha Kerr (Sky Blue) right footed shot from the centre of the box is saved in the centre of the goal. Assisted by Taylor Lytle. Substitution, Houston Dash. Melissa Henderson replaces Nichelle Prince. Attempt saved. Samantha Kerr (Sky Blue) header from very close range is saved in the top centre of the goal. Assisted by Kelley O'Hara with a cross. Substitution, Sky Blue. Daphne Corboz replaces Nikki Stanton. Corner, Houston Dash. Conceded by Christie Pearce. Attempt saved. Nichelle Prince (Houston Dash) right footed shot from outside the box is saved in the centre of the goal. Assisted by Janine Beckie. Attempt missed. Sarah Killion (Sky Blue) right footed shot from outside the box misses to the left. Assisted by Raquel Rodríguez. Attempt blocked. Raquel Rodríguez (Sky Blue) left footed shot from the centre of the box is blocked. Erica Skroski (Sky Blue) wins a free kick on the right wing. Second Half begins Sky Blue 1, Houston Dash 1. First Half ends, Sky Blue 1, Houston Dash 1. Attempt missed. Amber Brooks (Houston Dash) header from the centre of the box is high and wide to the left. Assisted by Janine Beckie with a cross following a corner. Attempt missed. Andressa (Houston Dash) right footed shot from outside the box is high and wide to the right. Assisted by Morgan Brian following a corner. Goal! Sky Blue 1, Houston Dash 1. Andressa (Houston Dash) left footed shot from the centre of the box to the bottom right corner. Andressa (Houston Dash) hits the left post with a right footed shot from the centre of the box. Attempt missed. Janine Beckie (Houston Dash) left footed shot from the centre of the box is close, but misses to the right. Assisted by Nichelle Prince with a through ball. Attempt blocked. Nichelle Prince (Houston Dash) right footed shot from the centre of the box is blocked. Assisted by Amber Brooks. Attempt missed. 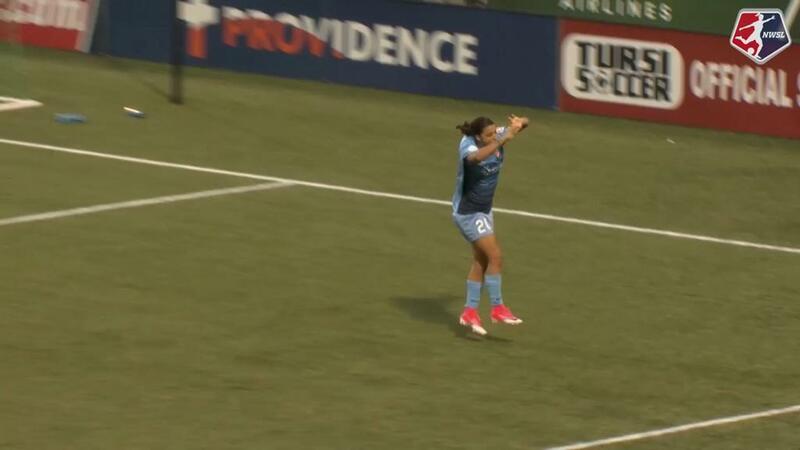 Kelley O'Hara (Sky Blue) right footed shot from the right side of the six yard box is close, but misses to the right. Assisted by Samantha Kerr with a cross. Attempt missed. Cambria Privett (Houston Dash) right footed shot from a difficult angle on the right is high and wide to the right. Assisted by Amber Brooks following a set piece situation. Goal! Sky Blue 1, Houston Dash 0. Sarah Killion (Sky Blue) converts the penalty with a right footed shot to the bottom left corner. Attempt missed. Amber Brooks (Houston Dash) right footed shot from outside the box is too high. Assisted by Andressa. Attempt blocked. Samantha Kerr (Sky Blue) right footed shot from outside the box is blocked. Assisted by Kelley O'Hara. Attempt missed. Nichelle Prince (Houston Dash) right footed shot from the right side of the box misses to the right. Assisted by Rachel Daly. Attempt missed. Nikki Stanton (Sky Blue) right footed shot from outside the box is high and wide to the right. Assisted by Raquel Rodríguez.